On 21:19, evening time, Daniel Ricciardo was announced as 2nd driver for the Infiniti Red Bull F1 team for 2014 on the austrian TV channel Servus TV. He will replace Mark Webber, who drove for Red Bull from 2007-2013. Webber will compete in the FIA World Endurance Championship in 2014, including the 24h of Le Mans, in a Porsche LMP1 car. Red Bull said that they’re aiming a at least three year partnership with Ricciardo. Ricciardo is in the Red Bull Junior programme since 2010. He was test and reserve driver and also drove in the WSBR, finishing 2nd in the standings. Then he was replacing Narain Kartikehyan at the 2nd hafl of the F1 2011 season in a HRT F111. He then joined Scuderia Toro Rosso in 2012. His teammate Jean Eric Vergne was always more consistend on points, but Ricciardo was the faster driver, especially on one Qualifying lap. The decison from Red Bull to take Ricciardo was quite obvious. I never took the Raikkönnen/Alonso romours seriously. It would be stupid if they won’t have taken Ricciardo, because then the philosophy of the Toro Rosso team would be in question. At the start of the GP Lewis Hamilton was leading into Turn 1. Vettel tried to hold of Grosjean on the outside of the track. Rosberg meanwhile, who started from 4th position had contact with Massa’s frontwing at Turn 5. Rosberg had to go wide and settled for 12th postion, then he overtoke some cars bringing him to 7th but then he retired 10 laps before the end of the race due a engine failure. Hamilton was leading ahead of Vettel and Grosjean until the first pitstops came around the laps 9-13. Vettel already had to defend his 2nd position against Grosjean and surprisingly struggled with the handling of the car. After Vettel made his first pitstop, he came back behind McLaren driver Jenson Button, who held him off for 33 laps, what was a quite amazing perfomance from the brit. So Vettel held up Grosjean, and some laps later Alonso was becoming faster, so it became a four way battle for 2nd. Vettel finally got past Button for 2nd and Grosjean was also trying to pass Button, but with contact resulted to a penalty after the race. After Grosjeans 2nd pitstop, he was behind Massa. Grosjean was much faster than the Ferrari driver and tried a brave outside move into the blind Turn 5 corner, which was succesfull but illegal. He had all four wheels off the track and he was over the line, so he gained an advantage over Massa. The frenchman got a drive through penalty and later made his third pitstop, he ended up in 6th position. His teammate Raikönnen however had a fantastic strategy and despite the hot weather there he managed his tires very well and made only two pitstops. So he came up to 2nd, but Vettel was close behind him and tried a ”Grosjean move” on the outside of Turn 5. 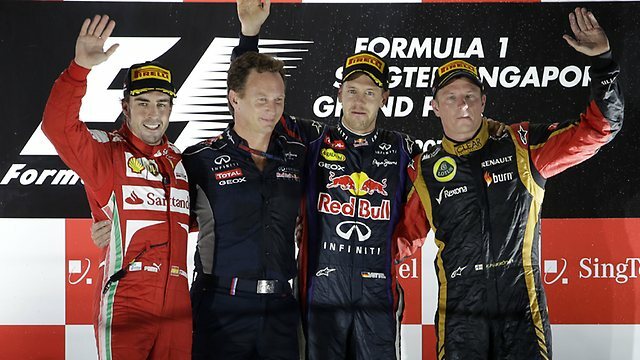 But Raikkönnen defended and kept his 2nd place until the end. Webber had a great race, coming from 10th on the grid after his bad luck in Qualifying to 4th in the race. Hamilton controlled his lead and won the Hungarian GP after 70 laps. It was his first GP win of the season and the third for Mercedes AMG Petronas. Sutil had a horrible 100th GP, he had problems starting his car again at his first pitstop and had to retire. Williams meanwhile scored their first points of the season with Maldonado finishing 10th. Teammate Bottas had to retire after an engine failure. The next race of the Formula 1 World Championship is on the 25th of August for the Belgium GP at Spa-Francorchamps. So now i will talk a bit about the Spanish GP. Well Alonso won his first Spanish GP since 2006 ahead of a disappointed Raikkönnen and teammate Massa. Mercedes went backwards in the race-Rosberg was from Pole to P6, teammate Hamilton from P2 in Quali to P12 in the race. Vettel was 4th, but he’s still leading the championship with only 3 points ahead of Raikkönnen. So my problem is that the tires are ruling the races in F1 WAY too much. The drivers have to look more over their tires then on the most important thing- namely driving the car to the limit!!! The tires from last year were still ok and some could still drive very fast, but now Pirelli overstated it. I mean did anybody requested (aside of the FIA) that they should do new tires for the 2013 season? No i don’t think so and you see the result of it. So the drivers and teams are complaining about the tires and blaming Pirelli. But don’t blame Pirelli, they’re just doing their job. You have to blame the FIA for that, they requestet for that back in 2011, when Bridgestone just left. So how should be the tires for the future? Well Pirelli announced to revise the tires for the British GP, so two GPs to go until that happens. Anyway i will want the 2nd option because i hope the tires are at least so hard like in 2011, were it wasn’t so crazy with the tires like nowadays. Or better bring them to 2010 form (but i don’t think it will happen). Because i think 2010 was the last F1 season with real racing, no DRS, no KERS, no tire zick zack whatever, just side by side racing and that’s it. However the next GP- in Monaco will be a lot different than the last one. The track characteristics are a lot different and the surface is completely different. So it’s still going to be exciting. UPDATE: The new tires come already to the Canadian GP with option 2 (2013 composites).